Use the menu above to find out about our Branch Meetings and occasional activities. This site features research reports about the Great War as it was experienced in our neighbourhoods (Articles) and other resources that might be of interest to people studying the Great War (Study Resources). While Milton Keynes is a new city, it incorporates several old communities – Wolverton, Bletchley, the Watling Street coaching towns of Fenny Stratford and Stony Stratford, and several very old villages. 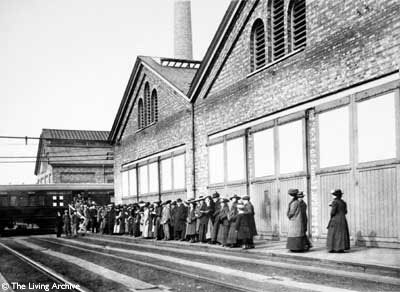 Wolverton is famous for its railway works and for the Ambulance Train completed here in March 1916 – the photo below shows people queuing to view it – click on the photo for the full story (on another website). Surrounding the new city is the countryside of Buckinghamshire, Northamptonshire and Bedfordshire (each with their WW1 regiments), and we welcome participants from as far away as they wish to travel! We are a small WFA branch, but we are a mutually supportive group of people sharing a fascinating and at times moving interest in an event which shaped the 20th century, and still affects many people in very personal ways into the 21st century. We no longer offer local Branch membership, but encourage all who are interested to join the WFA nationally: all our meetings are open to the public. If you would like to join the WFA, please see the Membership link above. You are welcome to join our Branch mailing list by sending a message using the Email Us link above: then you will receive email reminders of meetings. 1914-1918, to perpetuate the memory, courage and comradeship of all those who served their countries in France and Flanders and their own countries during The Great War. It does not seek to justify or glorify war. It is not a re-enactment society, nor is it commercially motivated. It is entirely non-political. The object of The Association is to educate the public in the history of The Great War with particular reference to the Western Front. Applications for membership are welcomed from anyone with a like mind.